It seems like Ranbir Kapoor leaves long lasting impact on his exes that’s why Deepika Padukone and Katrina Kaif give hints of not coming together ever. These two actresses have two things common between them first both are biggies of Bollywood, and second is Ranbir Kapoor. Both the actresses were once deep in love with Ranbir Kapoor, the heartthrob of Bollywood. Recently Deepika attended Neha Dhupia’s sought out talk show Vogue’s BFF. 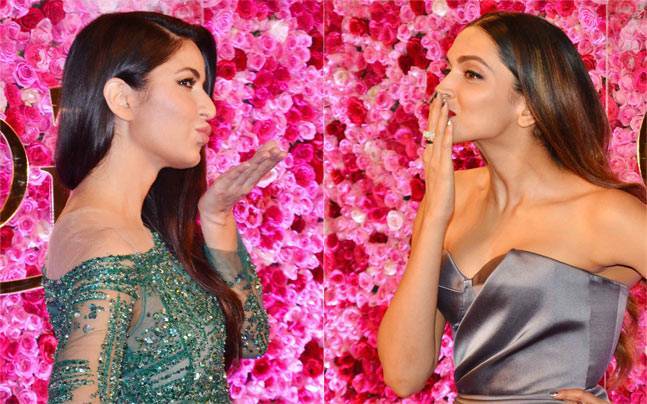 In the show, Neha asked Deepika during the ‘Say It Or Strip It segment’, if Katrina would be invited to her wedding? To everyone’s big surprise Deepika gave a big NO as her answer. Yes she said No, which clearly means Katrina wouldn’t be in the guest list of Deepika Padukone’s wedding. We all know that both the actress have dated Ranbir Kapoor, and Ranbir Kapoor cheated on Deepika with Katrina Kaif. While Ranbir and Deepika have buried their hatchets and are now good friends, it seems two ladies are not in any mood to mend their ways and set in harmony. Deepika also said, “Sometimes you have a certain feeling for other people and they don’t necessarily feel the same way about you. But that’s okay,” however, she also added that she was “extremely fond” of Katrina personally and professionally. On the other hand Katrina Kaif is also not having any plan to work on her equation with Deepika, even though Ranbir is not dating any of these two ladies and is single right now.